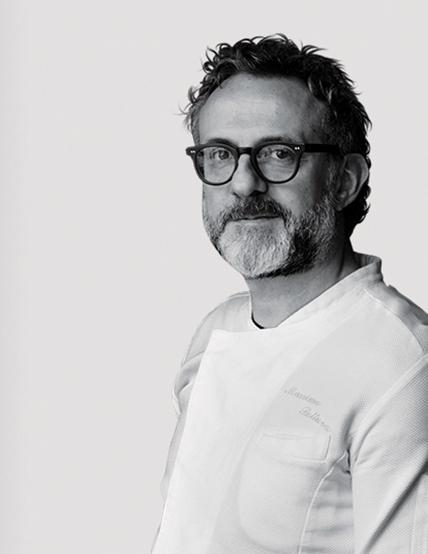 Massimo Bottura is famous for upending Italian cuisine at Osteria Francescana, in Modena, Italy, which topped the World’s 50 Best Restaurants list for 2016. With his refettorio—or “dining hall”—projects, he’s doing a different kind of groundbreaking work. Beginning with 2015’s Refettorio Ambrosiano in Milan, followed by outposts in Rio, London (opening in June), and, soon, the U.S., Bottura is helping to feed the hungry, reduce the 1.3 billion tons of food waste accumulated each year, and rebuild communities. How do the refettorios work? "Food for Soul [Bottura’s nonprofit] connects with local charitable organizations, [and] these groups invite the poor and homeless people we serve each week—as many as 100 meals per day in Milan. An abandoned theater was donated by a Catholic church in Milan, and in London we’ve partnered with an established soup kitchen and drop-in center. In Rio and Milan we can offer meals for free because all the meals are made with surplus ingredients donated by supermarkets, suppliers, and local markets, and the staff is mostly volunteers. Food for Soul has four full-time people, and there are a few permanent employees at each refettorio, like a supervisor, a head chef, and, in the case of Milan, a social worker. Rio also has a culinary school, offering job training for young people, in addition to a community kitchen. We find the volunteer staff through press, social media, and local churches. The London soup kitchen, Felix—named in memory of a young soccer player who cared deeply about the welfare of others—is currently in need of a lot of love and energy from people in the area. That is a mission of Food for Soul, to activate communities." Where did this idea begin? "The idea of not wasting food came from my grandmother. She taught me the deep Italian culinary traditions of not taking even a bread crumb for granted. For the refettorios, we found so many new ways for using ingredients that would otherwise be thrown away. But we can all be better about not wasting food, cleaning out our refrigerators by eating and cooking everything in them, and learning how to rethink the life span of ingredients." You’ve described Food for Soul as a cultural project, not a charity. How does that translate at the refettorios? "The idea, from the beginning, was to not just feed our guests, but to make them feel at home, cared for, and respected. We work with local architects, designers, and artists to create beautiful, light-filled spaces. Art on the walls, no plastic plates or cups but real ceramic and glass, freshly baked bread, and delicious three-course meals. Volunteers address guests by name, converse, and welcome them, day after day. This is part of nourishment—not only what goes into the body, but what the body perceives. I’ve always believed that food, art, and creativity are a universal language. Ethics and aesthetics go hand in hand. "